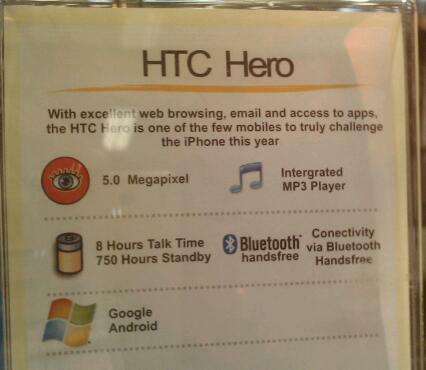 I was in my local Harvey Norman and walked past their display for the HTC Hero, out of the corner of my eye something just didn’t look right. Check out their use of the Windows logo to promote the fact that the phone time Android! I don’t think they get it. Or maybe that logo is now a generic logo for operating systems now. Update: @HarveyNormanAU contacted me via Twitter to ask which store it was so that they can fix this up. Never let it be said that we’re not tackling the big issues here people! Making the world a better place – one incorrect sign at a time.